Tres Chic was created by Tawnya Falkner, a force of nature who left the design world for the world of food and wine. Her dream was to grow grapes in France and make her own wine. Then, reality set in. Most people have absolutely no idea what an expensive venture that is. So, Tawnya went the frugal way and decided to find the best grapes in the area, purchase them and make the wine. Believe it or not, that's how most of the wine is made in the world. Most wineries buy their grapes. It's rare that a winery grows their own grapes to make their own wine. It works because there are a lot of independent grape growers out there. While fashion and glitz are definitely in Tawnya's DNA thankfully so is the strategic gene linked to the monetary gene. All these genes have to fit, or nothing will work. As many find out too late, the wine business takes a lot of capital to go along with the romance. 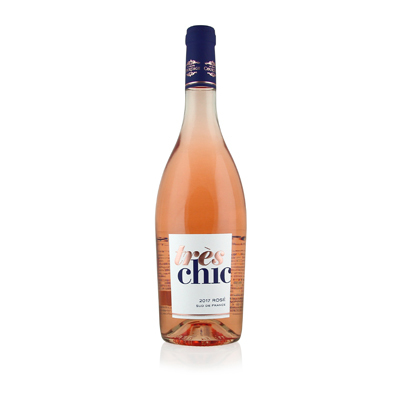 Our selection comes from arguably the finest area in the world for rose, the Provence. This large area runs along the coast for over 100 miles. Besides being breathtakingly beautiful, it is also a perfect place to grow Grenache and Cinsault, the blend that is in Tres Chic. While these grapes also make great red wine, rose has been such a staple here, that it has literally taken over the wine world. It's easy to tell why with one sip. The strawberry, lingonberry and cherry hints are balanced by smacking citrus and a long, invigorating finish.